Cozy Chicks: Meet the newest Chick! As you know, our dear Heather is leaving the Cozy Chicks. While we're sorry to see her go, we're happy to announce our new Chick. Starting January 4th, Mary Kennedy will be stepping into the Saturday spotlight. Mary is a national best-selling author, and a clinical psychologist in private practice on the east coast. She has sold forty novels, all to major New York publishers, and has made the Waldenbooks, BookScan, and Publishers Weekly best-seller lists. Her early novels included middle grade fiction and young adult fiction for Scholastic and Penguin. Currently she's writing an adult mystery series. 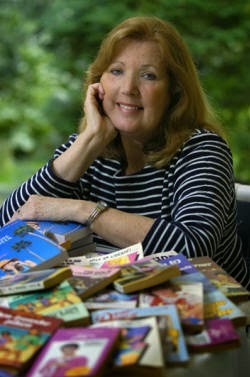 She writes the Talk-Show Mysteries and has a new mystery series that will debut this summer. As of January 1st, Ellery Adams will be stepping into the First of the Month spot with a monthly contest. We guarantee it'll be fun and challenging. So please welcome Mary, and look out for Ellery's first contest. That's awesome! Mary is a great author (I love her Talk Radio series) and a devoted animal lover (which is a good trait in a cozy author). She has a houseful of rescued kitties and supports many animal welfare organizations. I think she will be a great addition to the Cozy Chicks. Welcome Mary! Thank you so much, I am thrilled to be here!! What an exciting year this is going to be. I hope everyone is enjoying the holidays and gearing up for New Year's Eve which is (gasp!) right around the corner. Thank you so much, Ashley and Diane! Welcome, glad you could join! Yippee! So glad you're here, Mary! Welcome. I look forward to reading some of your books. Welcome Mary, hope to start reading your books! Thanks for joining the group. Can't wait to get into one of your books. Thank you so much, Loretta, and Rachelle and Ellery and lavendersbluegreen and Teachgifted kids. I am so happy at the warm welcome!! Looking forward to getting to know everyone. Welcome Mary! I'm looking forward to reading your books. I love that you are a die hard animal lover. I am a die hard animal lover too! Welcome to the best cozy blog Mary, I look forward to reading your posts and getting to know you. As for me, I am a Dutch reader, and still get surprised about typical American things.